The innovative PARATEST® System has had a real impact on the routine operations and costs of running laboratories that perform stool tests for parasites. This product has become a great success in parasitological research all over the world because it broke new ground exactly where the market needed it most, effectively benefiting the work of the lab technician. The PARATEST System encompasses the entire parasitological examination in stool, from collection, through conservation (Greenfix®), dilution, filtration, and transport, resulting in highly clean sediments for microscopic analysis. The system relies on a 266-micron filtering system, especially developed for DK Diagnostics. Thus, more tests are carried out in less time and space which leads to better cost-benefits than traditional methods. The polyester mesh homogeneity is also an important factor because it allows 100% utilization of the filtering area. Another factor for the success of this new product is the underlying methodology. Because of more effective filtering, the process only requires one step, i.e., the lab technician simply dissolves the sample by shaking the bottle, placing it in an inverted position for 15 minutes to obtain the proper concentration, followed by pouring a drop on the slide for microscopic examination. The methodology can be adapted to any other that better fits the laboratory’s routine, but all the product’s advantages will remain, no matter which methodology is chosen. Biosafe (no handling the sample). In the first half of 2010 the World Health Organization (WHO) launched a call for the submisison of new medical technologies. The goal was to identify and evaluate innovative devices already available, or in development, that addressed global health issues and concerns. The search was directed at products that would be accessible, appropriate, and feasible for use in low- and middle-income countries. DK Diagnostics submitted PARATEST to WHO’s committee of evaluators, which carefully scrutinized all the technologies it received. The committee selected only 15 of the many presenthat were sent in. PARATEST is item 1.1. on the report. WHO subsequently in- vited PARATEST to be part of the Second Global Forum for Innovative Devices, which took place in Genève last month. PARATEST ECO, the first and only biodegradable parasitological system on the market, developed its formula based on Greenfix, a non-toxic biodegradable preservative. It is not harmful to the environment and it replaces dangerous fixating solutions, such as formalin, SAF, and PVA. The product contributes both to the safety of the laboratory technician and to environmental sustainability. Sample amount: Hoffman uses 5 grams of fresh stool; PARATEST only 2 grams of preserved sample. Accessories: Hoffman needs wooden pick, screens or gauze, cup, Pasteur pipette or straw; with PARATEST nothing more is necessary. Water: Hoffman uses reagent water for washing the accessories; PARATEST doesn’t use water. Minimal time for sedimentation: Hoffman requires two hours while PARATEST takes only 15 minutes. Debris on the glass: Abundant with Hoffman, minimum with PARATEST. Sample conservation: Hoff­man 30 minutes; PARATEST 15 days. Physical space required for sedimentation (25 samples): For Hoffman at least 10 square feet are needed; PARATEST needs only 1 square foot. 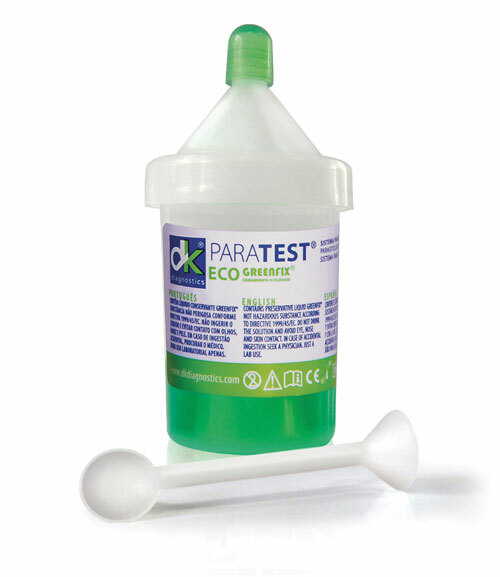 DK Diagnostics, exclusive PARATEST manufacturer, is a solid and innovative company that supplies definitive solutions for the parasitological test area. With extensive experience in the diagnostics area, DK Diagnostics manufactures the most efficient and state-of-the-art parasitological tests in the form of the PARATEST System. DK Diagnostics has international certifications such as ISO 9001:2008 and ISO 13485:2003, which effectively ensure a high quality standard of the product; the FDA register (Food and Drug Administration), EC Stamp (European Community Stamp), and SFDA (Saudi Food and Drug Authority). The product completely fulfills the requirements of quality and safety, for people as well as the environment, in more than 20 countries. Since 2013, DK Diagnostics has established manufacturing plants in the United States, Spain, and India. Its plant in Brazil opened in 2004.